[Headline News] Community service organizations affiliated with the Christian Gospel Mission: Christian Gospel Mission Voluntary Worker Association, One Love Community, etc. The Christian Gospel Mission (CGM) is known for their encouraging affiliated community services and vigorous activities that boost social services. The Christian Gospel Mission Voluntary Worker Association was formed with the purest purpose of offering community services while One Love Community conducts Shared Hope campaigns and the Global Peace Cultural Union boosts intercultural exchange activities. These all are community service organizations affiliated to CGM. There are many community service organizations, besides Christian Gospel Mission Voluntary Worker Association and One Love Community, affiliated with CGM according to their understanding of values which stems from the idea that “religion is a lifestyle.” Through them, CGM has been boosting various social activities that communities need. On top of that, they also carry out their community services overseas beyond Korea through their Global Peace Cultural Union, which serves as the vanguard to their community service activities abroad. During nationwide crises, such as the IMF(International Monetary Fund) crisis, CGM has held save-the-nation prayer assemblies and provided support for overcoming the national crises. Furthermore, in order to foster a healthy national spirit, which goes well with the current the 21st-century social environment, they started out doing pure cultural art activities and currently are contributing to the development of healthy culture. Greatest of all, one of their most successful services, even when compared to services that other denominations provide, is the initiation and development of an ideal world of love and peace centered on God through international exchanges and cultural art activities overseas. On June 6, CGM is planning to carry out social activities that will draw people’s attention once more, holding their 2005 Shared Hope Marathon hosted by Christian Gospel Mission Voluntary Worker Association and One Love Community which is also a national employees union. They are going to use the 5K bike lane at Hangang Park in Gwangnaru as a track and are expecting a thousand participants. All proceeds from the event will go to supporting people who need hope and love, such as hungry children, teens without guardians, the elderly homeless, deprived people struggling with illnesses, and etc. 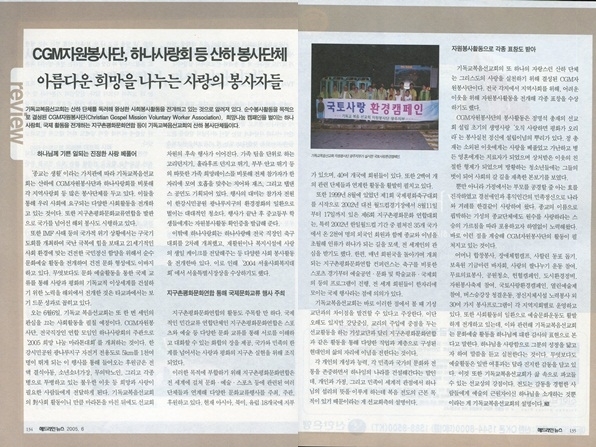 Since it is a CGM social activity, even after the marathon, there will be follow-up events coordinated by the ministry. They have planned family games, such as Ring Toss, Toss and Run with Hula Hoops, Holding and Running Couples, and Hope Race, including cheer, jazz, and tap dance events where all participants can gather and dance as one. The finale of the event is extensive cleaning. All participants will help clean up Hangang Park in Gwangnaru as a way to protect the environment. After the event, they will issue a voluntary service certificate to middle and high school students. Besides this, One Love Community held their One Love National Cup Employees Soccer Tournament twice and did various volunteer activities, such as delivering birthday cakes to rehabilitation facilities and welfare facilities. 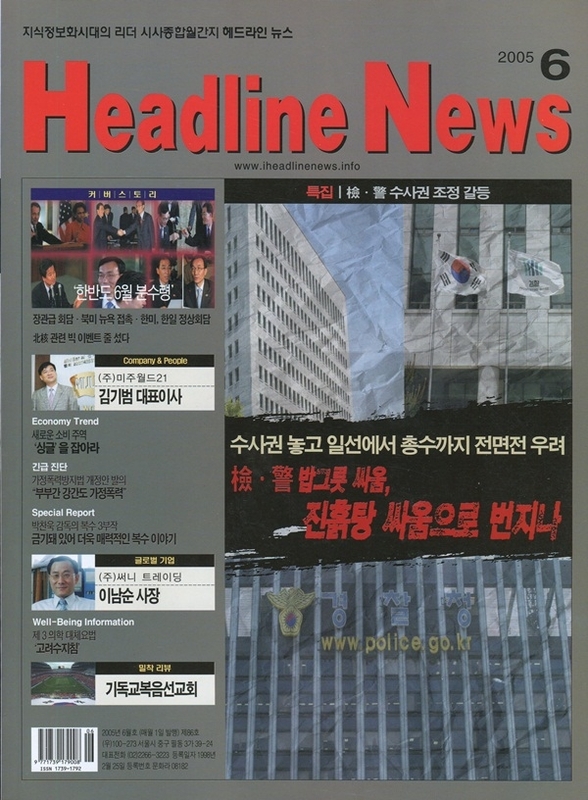 As a result, they were awarded the Seoul Metropolitan City Mayor Award at the 2004 Seoul Social Welfare Contest. The Global Association of Culture & Peace, which is an international non-governmental exchange federation, provides opportunities of harmony for people to understand and communicate with each other through various cultural exchanges, such as through sports or the arts. It was formed to actualize global love and peace, which cross over the bounds of nations and ethnicities. In order to achieve their goal, the Global Association of Culture & Peace hosts, holds, and sponsors various cultural exchanges, affiliating them with many different associations related to cultures, arts, and sports throughout the world. Currently, they have members in 40 different countries in Asia, North America, Europe, and Oceania. Also, they are actively involved in activities with over 200 affiliated associations. In addition, after holding their First International Peace Soccer Tournament in August in 1999, they held their Sixth Global Peace United Cultural Conference at Daejeon World Cup Stadium from August 11 to 17 in 2002. Significantly, it was held during the 2002 FIFA World Cup Korea/Japan tournament, and approximately 2,000 foreign members from 35 countries attended. Since the theme of the event was to seek a way for mankind to become one beyond the boundaries of different religions and ideologies, the event drew people’s attentions from all over the world. The Global Peace United Cultural Conference is held in a member country and rotates every year. Each conference has various programs, such as sports games--not only soccer tournaments--art performances, cultural and scholarly exchanges, international conventions, and etc. The events are meaningful because they are international events where members from all over the world gather in one place. In regards to this aspect, CGM asserts that this is how they are different from other Christian organizations. What they mean is that even though they are misunderstood as a cult, differing from the way Christians usually do ministry, which focuses only on lecturing and stuffing their doctrines in people’s heads, CGM spreads the spirit of lives to people from many different careers and classes through events like the Global Peace United Cultural Conference. They also explained that in other words, while respecting each individual’s individuality and ability and each nation and country’s culture and traditions, they are building up God’s nation. The reason is to let individuals, families, and nations fulfill God’s Will of Providence in a global perspective. This is the fundamental purpose of their ministry. One of the other associations proudly affiliated with CGM is CGM Volunteer Service. It was created to put the love of Christ into practice. Because of the community service they have offered to regional communities for the nation and poor neighborhoods, they have received many different types of commendations. The community services CGM provides are motivated by their love for life, which is also the service mentality Chairman Jung Myung Seok established when he first founded the Mission. He said, “Peace will come only if you love.” CGM Volunteer Service made this motto the root of their services. Chairman Jung shared his love with isolated neighbors, became a healer to spirits who were poor and sick, a kind brother to people who were hurt, and a friend to young people who strayed from life. He is an example and walks on a path that society should follow. Not only this but he has also shown filial piety to his parents since he was young and constantly loves his nation and people with Gyeongcheonaein* and humanitarianism, which both contain Korea's national spirit. Despite persecution from other Christian groups in the name of religion, he has been trying endlessly to embrace them, following Jesus’ teaching, “Love your enemies.” After having inherited this kind of teaching, CGM Volunteer Service has been doing their job. Besides Mother’s Ensemble Volunteer, Handicap Experience Camp, Helping Sakhalin, Fundraising Bazaar for Orphanages, Sharing Rice with Love Movement, Free Medical Service Volunteer, Clean Up Parks, Blood Donation Campaign, Urban Environmental Improvement, Volunteer Service Festivals, Home Land Environment Campaign, Open Art Festivals, Clean Bus Station Movement, and Mental Retardation Facilities Volunteer, 30 other volunteer programs are currently running through their regional branches. 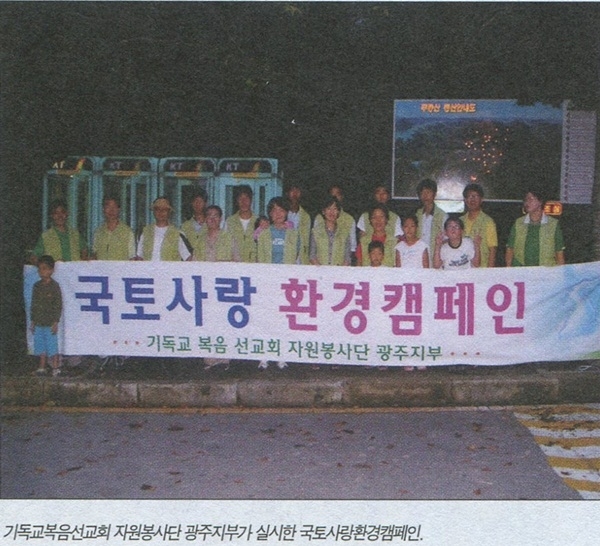 From December 25, 2007, they have been doing community service activities related to the oil spill accident at the coast of Taean. In addition, they are actively involved in art and cultural movements as a part of the social activities they do. About this, CGM considers cultural art activities as an expression of thanksgiving to God, that is, hearing the Word and taking action on the Word to resemble His nature out of their love for God. Above all, differing from other types of entertainment, their art activities contain sincere inspiration. This is also one of the strengths of their ministry, which CGM uses to create a deep impact inside of people’s lives. “Evangelism is simply introducing God, who is the origin of art, to people who experience His inspiration,” explained CGM.